With daylight hours starting to wane, the activity around backyard bird feeders is actually gearing up. Hummingbirds especially are frenzied around feeders, preparing for their migration south.Be sure to keep your feeders fresh and full until freezing becomes a problem. Seed feeders too are being emptied at quicker rate. This cool glass bird feeder holds five pounds of seed, but it’s being filled every 3 or 4 days at our place. And it’s not the only one! Our North Georgia yard hosts about 20 different kinds of bird feeders! It’s wonderful to watch, when the time is actually taken to sit on the deck with a cup of coffee and just watch. Some friends visited last week and said: “it looks like Hartsfield Airport at rush hour back here”. Honestly… at times it really does! Since backyard birding has become such a popular hobby over the last few years, the array of functional products has pretty much exploded. Artisans and smaller companies are offering hand crafted wares like wild bird feeders, birdhouses and cool bird baths in a myriad of materials. Copper, vinyl, stoneware and ceramics are those materials with durability to last a lifetime. And unlike wood… the squirrels can not chew them to pieces! 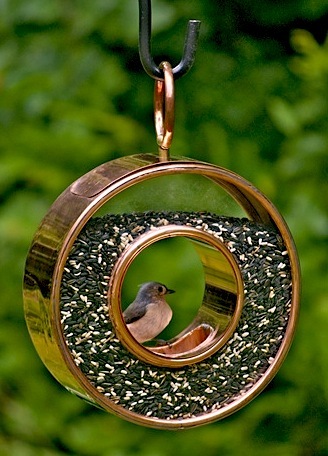 This solid copper bird feeder with unusual design is actually quite beneficial. The large hat-like roof not only protects seed and birds from the elements, but also acts like a baffle to deter squirrels. In two sizes, this gorgeous copper feeder will weather over time to a lovely patina finish, and it’s an awesome addition to any garden or landscape setting. 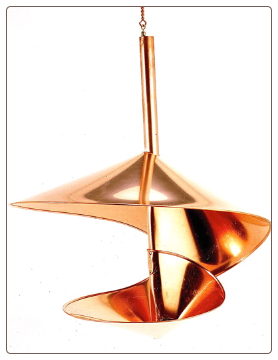 The retro is new breed of wild bird feeders with it’s groovy space ship design. Made in Germany, this quality feeder has a large seed capacity which stays protected from elements in the encased seed wall. 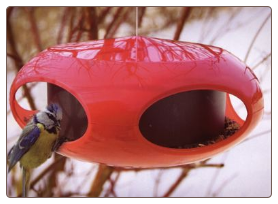 In vibrant raspberry, lime or white, these wild bird feeders are totally fun and functional. And of course, Mr. Cool Cat is a stoneware feeder with a tube-like function. Squirrels will never dig their teeth into this weatherproof stoneware, and he’s n absolute hoot to watch feathered friends perched at his mouth enjoying a meal! In black or tan to resemble your favorite feline, these wild bird feeders are a unique addition to any environment… and bird love them too! With buds popping up from the ground, and buds starting to bloom, we know spring is just around the corner. This is a great time for spruce up in the yard. Please remember to clean out birdhouses in preparation for new visitors, and dispose of the nest in the trash or a good distance from the house as old nests will attract predators. 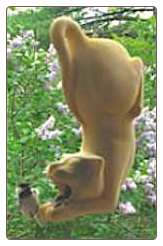 Wild bird feeders should be cleaned periodically to remove mold and bacteria thus preventing the spread of disease. Scrub with a simple bleach solution of 1 to 10 parts water, and rinse thoroughly. This works just as effectively s any commercial bird feeder cleaning sprays. Welcome spring and happy birding! Bird Feeders are no exception to this rule. A new generation of wild bird feeders range from fun and funky, to antiqued and retro, even the simplistic style of Feng Shui. Most are hand crafted, bringing individual style and uniqueness to each piece. Materials that have been around forever are being used to transform the mundane into terrific art for the garden. Art to be admired, enjoyed, and to feed the birds! 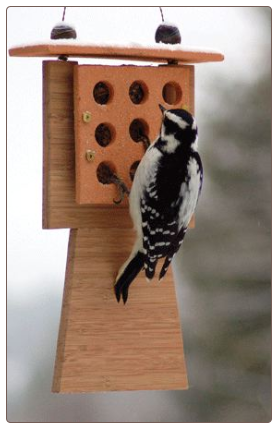 Wild bird feeders for suet, seed, fruit, or just about anything you’d like to offer feathered friends, are crafted by those who have a passion for birds. The quality will surpass any wild bird feeder found in a “big-box store”. The suet feeder shown here is anything but your traditional wire cage. Sustainable bamboo, glass and stoneware are used to create this beautiful, yet functional wild bird feeder. Weather-proof stoneware is also used in creating the oh-so-fun Hot Lips Hilda. She’s a seed feeder who’s guaranteed to entice many a wild bird. Whether you’re considering a new feeder for the winter season, or maybe in search of a great gift, consider uniqueness, quality and just plain fun as factors. Wild bird feeders help feathered friends to thrive and flourish all year long.